Product Code: SYM-510, is testify to its reliable functions under various kinds of unfavorable circumstances. The internal battery with at least four hours’ working time and rack of multiple uses facilitate transportation and emergent treatment. The ventilation modes it has include A/C, SIGH, SIMV, SPONT and Manual. The data displayed include tidal volume, minute volume, total breath rate, peak pressure and pressure-time waveform. 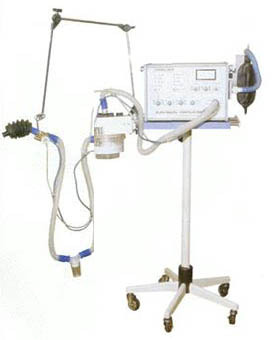 Intelligent apnea backup ventilation technique is also adopted in this machine. 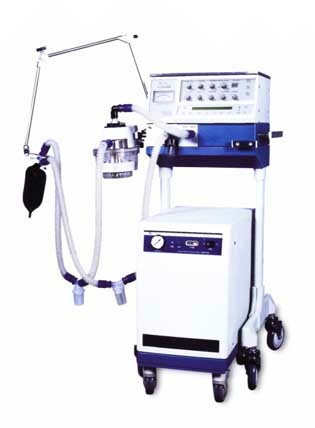 SYM-500, Electrical Ventilator is a result from the coperation the application of reliability techniques and micro-processor controlled between Shanghai Medical Equipment Factory and the Teching and Research Sectio on Reliability of Shanghai No.2 Industrial University. SYM-500 ventilator is an electroniccontrolled electric-driven, time cyeled,volume constant ventilator for the ventilation administration and care to the patient of respiratory failure in emergency sited. during transportation of patient,in hospital or at home With a welldesigned cylinder pump system the ventilator is able to output a precise volume and saves the time for maintenance. 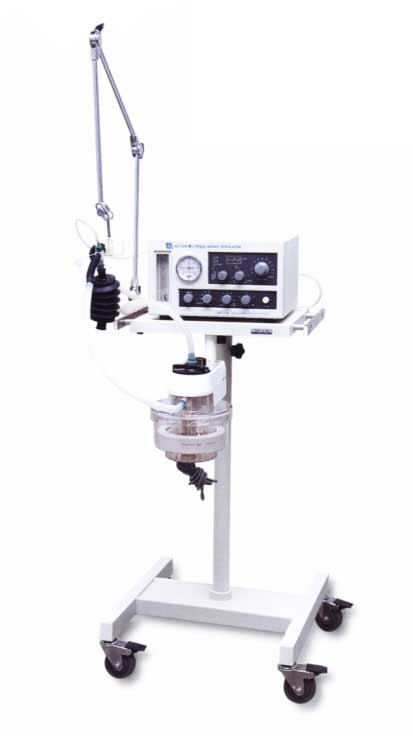 Oxygen concentration in the inhaled gas can be adjusted through a oxygen enrichment kit conected to the gas take-in socket.The ventilator can also be furnished with humidifier,oxgen analyzer. trolley, arm support, etc. to extend clinical application. With internal battery keeps machine work another 120 minutes. SYM-500A, Electrical Ventilator is a time electrical-driven, electronic-controlled, time cycled and volume constant ventilator for the respiration administration and theaply to the patient with ARDS or respiratory failure. This ventilator configures two ventilation modes of IPPV and IPPV/ASSIST, and monitoring functions as high and low airway pressure, wrong sestting and etc. The alarm is visible and audible. 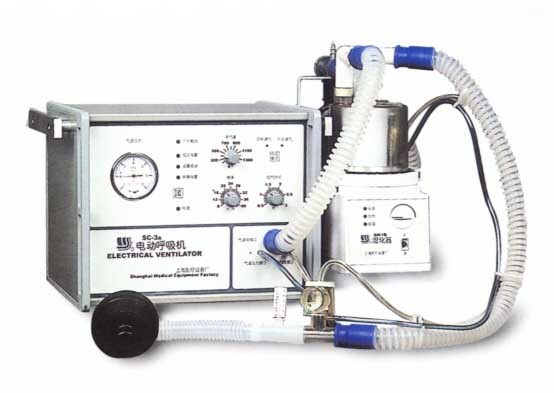 The ventilator is not only a state of multi-functions but also a great convenience in manipulation. Because of electrical driven and electronic-controlledl, the ventilator needs no compressed air, and the work is at low noice. Being an electrical conrolled and electrical driven ventilator which is volume constant and time cycled. SYM-300A is designed to administer longterm ventilation and ventilation rescue for patient of respiratory failure in hospital or at home. SYM-300A electrical ventilator has configured ventilation models of IPPV and IPPV/Assist and built in alarms for airway pressure low,setting errors as well as multi-function,further more theventilator has a unique feature that air compressor is not required for easy operation and saving cost. 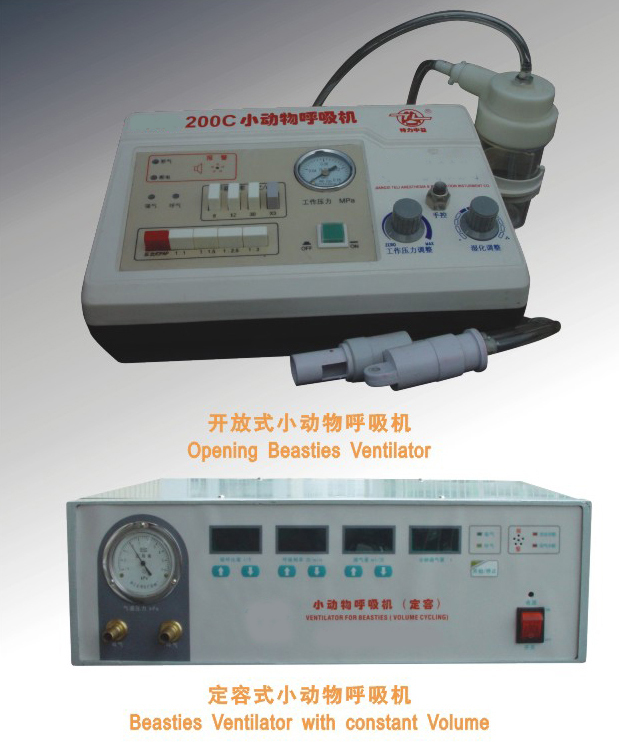 SYM-300A electrical ventilator is suitable for both adults and children. SYM-200 infant ventilator is designed to meet the special needs of respiratory therapy and respiratory management for infants and children. This ventilator uses constant flow, pressure limit, time cycle ventilation mode.With the feature of compact in design and easy in operation. 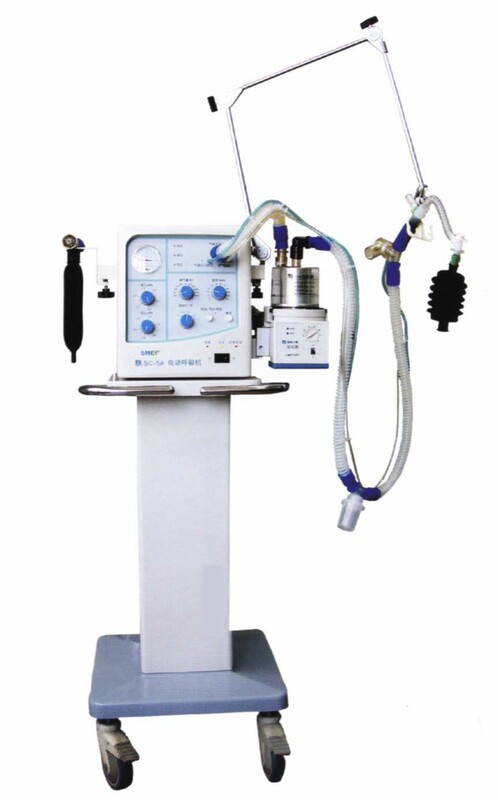 It is an reliable and elementary instruments in emergeccy and ICU rooms. 2.Pneumatic driven, electronic controlled.Wide selection of ventilation modes.Volume constant, Pressure control,Pressure support etc. 4.Monitoring of airway pressure and ventilation volume. 5.Advertisement of operation for easy use. 6.Build-in alarm function for safety. SYM-J1 is a time cycled constant volume respirator for controled mechnical ventilation in emergencies of all types.for respiratory rescue of accidents in mine traffic or industries,for artifical respiration during transportation of patients in ambuance,on ship,on aeroplanes or from operation room to intensive care unit.It can also be used for respiratory therapy with an attachable humidifier. The O2 concentration is adjustable to 55% or 100% To meet the needs of emergencies, the frequency and minute volume scales have three different colous for administering artifical respiration to infants,children and adults correspondingly. 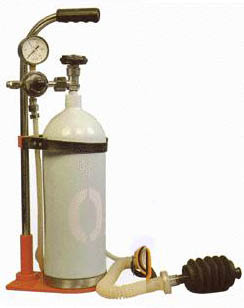 With O2 or compressed air as gas supply.no electricity is required. Small in size,light in weight.easy to carry and simple in operation. 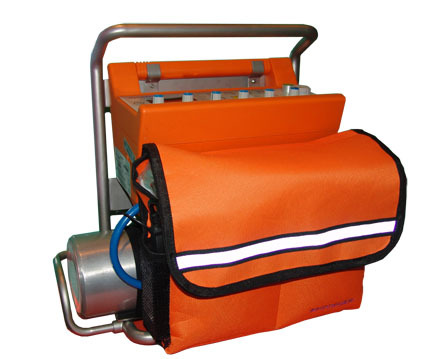 SYM-J1 represents an ideal ventilator for all emergency cases. 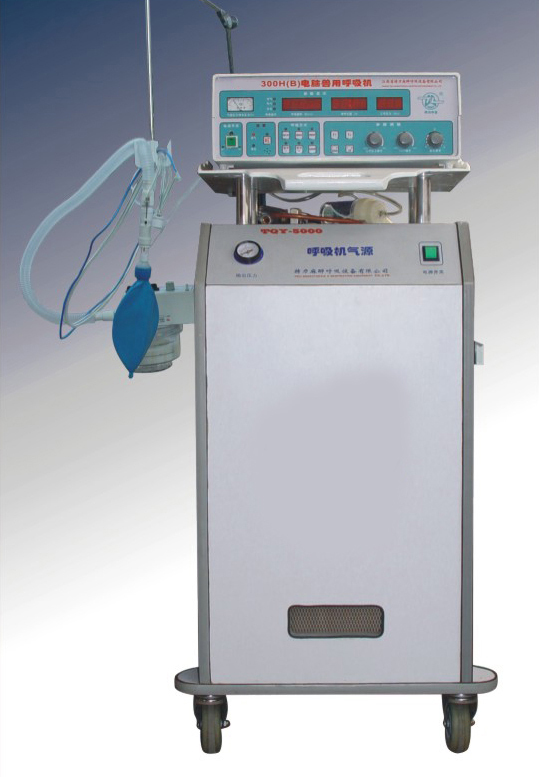 Animal ventilator is controlled by single chip based on opening high frequency jet ventilation, it adopts opening ventilation mode with high frequency and low tidal volume so that the airway pressure is low with little effect on blood stream recycling to heart and it helps to increase the blood flow from the heart and to promote the oxygen combination. No need to keep synchronization with respiration, the device can supply oxygen accessorily and controlled ventilation as well. When ventilating, the suction in airway can be adjusted at the same time. A. It is widely used for the respiratory management, treatment and first-aid & palinesthesia of animal such as cattle, horse, tiger, elephant, and panda etc big animal. C. The device can ventilate through the endotrachea tube and its operation does not need to keep synchronous with respiration. It can be used for tracheotomy in an emergency. --　Ventilation Modes: HFJV (High Frequency Jet Ventilation);CPAP(Continuous positive airway pressure); Pro I and Pro II ventilation; HFJV+SIGH ventilation; Manual ventilation. ventilator for beasties is designed according to the principle of open jet ventilator,its ventilation mothod is not only high frequency with low tidal volume but also regular frequency with great tidal volume. A. Adopted the ventilation technique which is opening high frequency with low tidal volume, the airway pressure is low, little interference to refluxing bloodstream,effect of oxygen compound is good, the oxygen partial pressure can be increased rapidly. When great tidal volume is adopted, CO2 can be discharged easily. B. Convenient connecting, it can be connected through the nasal and endotracheal tube.also can connect directly from chest. C. The ventilation mode with high frequency and low tidal volume will not easily produce pressure injury. D. The effect of oxygen dirrusion is so good that the tested beastie can stand for a long time. E. Adjustable oxygen concentration, the ventilation mode with continuous supply oxygen and good humidifying effect can ensure beastie to respire independently. F. Apply to manual ventilation test for monkey, rabbit, dog etc animal. G. Configured with multiform ventilation tube for beasties, or connected with other gas source. 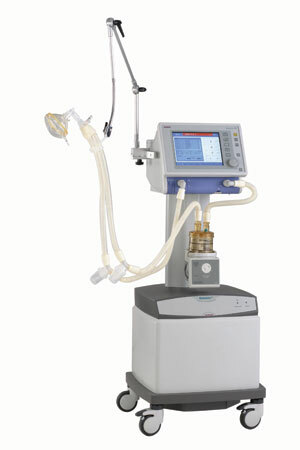 --　Ventilation Modes: HFJV (High Frequency Jet Ventilation); CPAP (Continuous positive airway pressure); Manual ventilation.